Ohio is a big part of the history of the Corn Belt, and when I started research on my book, Midwest Maize, a few years ago, I definitely wanted to interview people in Ohio. I was directed by friends to Ed and Sylvia Zimmerman, who have a farm not far from Columbus. That was a few years ago, but we enjoyed each other’s company, and I’ve been invited back a few times. My most recent visit, a few weeks ago, is when I learned about the festival I mentioned in the previous post—but that’s not why I went to visit. Sylvia had invited me to not only spend a few days on the farm, but also to speak at the Magnetic Springs Café—her newest project, which was just an old building at the beginning of refurbishing when last I visited. The topic was, of course, corn—I have a presentation I give titled “How Corn Changed Itself and then Changed Everything Else.” I’d given it successfully at a few venues in Chicago, but this time, I’d be surrounded by corn people—people who live with corn, from developing seeds to growing and harvesting to getting corn to market. A little intimidating. However, it was a wonderfully sympathetic crowd, as well—I didn’t have to convince them first that corn is a big deal. We had a splendid evening. Sylvia’s food was excellent, and my presentation was well received. 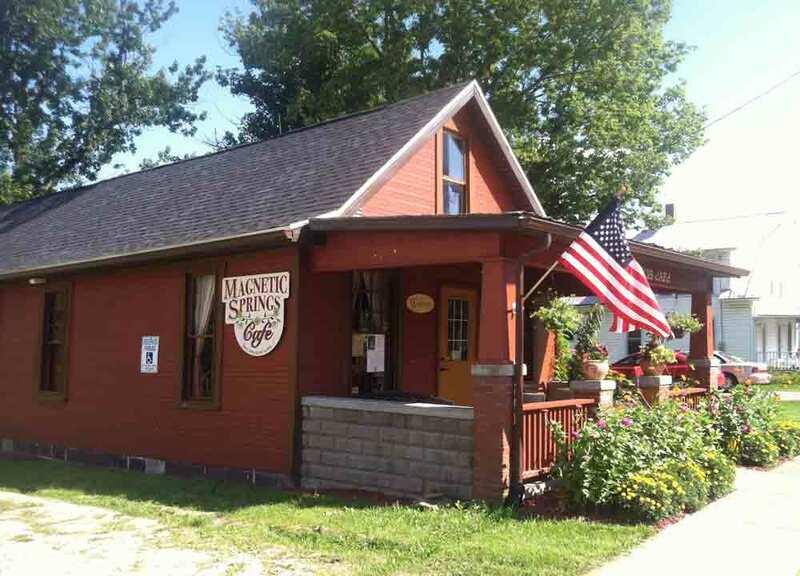 If you find yourself in the Columbus area and Magnetic Springs isn’t too far out of your way, you might want to consider detouring through and having breakfast or lunch with Sylvia at the café. The historic town is small enough that you don’t really need directions—find the main street, and you’re there. 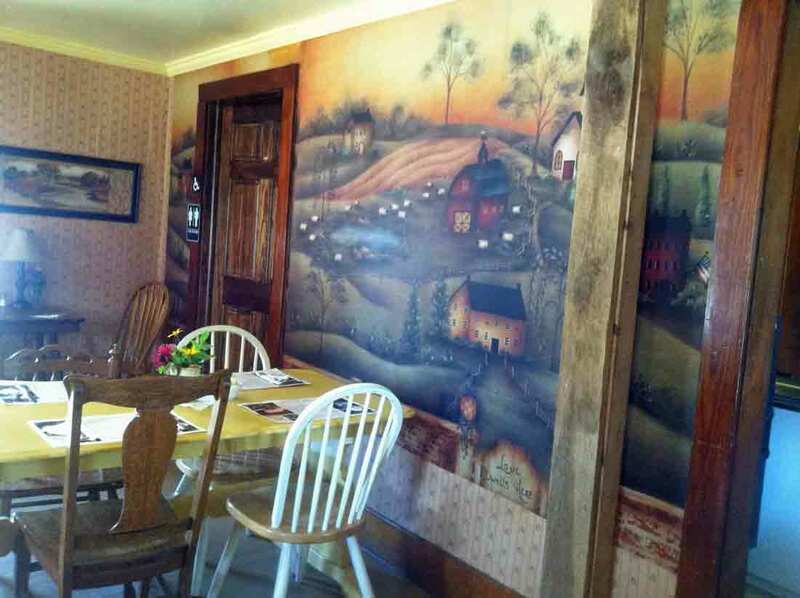 The meal will be excellent, home-style cooking in a charming setting. I’ll post more soon about other places in Ohio, as well as earlier visits to the Zimmerman farm. But since I shared a couple of posts ago about caring for mom this summer, I thought I’d also mention a few of the fun things I’d fit in, between hospital visits. So more to come. Traveling around the U.S. reminds one that there are myriad wonderful things to see, do, learn, and experience. During the summer and fall in particular, fairs and festivals join the museums and living history venues as potential destinations. On a recent trip to Ohio, I learned about a delightful festival that I won’t, in fact, be able to attend—but maybe you can. In the region just a few miles northwest of Columbus, rivers and streams are regularly crossed by wonderful, old, covered bridges. At least one of the bridges is large enough that it serves as a venue for events and dinner parties. However, next weekend, September 18–20, 2015, many of the bridges will be highlighted during the Covered Bridge Bluegrass Festival. As the name suggests, there is more to this than just covered bridges. There will be music, food, storytellers, crafts, cooking demonstrations, farmers’ market, horse-drawn carriage rides, and more. So if you’re in that part of Ohio this coming weekend, it might be something to add to your “to do” list. Should be a great way to celebrate the end of summer. For lots more info, including maps and schedules, check out festival website: Covered Bridge Bluegrass Festival. Farming reminds us of the cycles of life—but so do other things. This summer, I’ve spent most of my time a couple of states away from my home, caring for my mom, who is in her late 80s. The weeks I’ve spent with her at the hospital and the nursing home have exposed me to all stages of life, as children and grandchildren visit aging parents. As a result, I haven’t been posting much this summer—but I’m definitely not through with farming! I particularly like the September Life of a Farmer video from the Peterson Farm Bros, because it’s mostly about corn—as is, of course, my book. One of the things I discuss in the book is the creation of silage. I also mention trench silos. You get to see both in this video. Also in this video, they make silage out of sorghum. This is not a grain that will be familiar to most Americans—unless you’re from the South or have a farm. If you want to know more about this surprisingly important grain (fifth most important grain in the world), check out my post on sorghum on my The World’s Fare blog (and if you like baking, the post is followed by a recipe for sorghum cake). Now here are the Peterson Farm Bros sharing what September is like on their farm.